Whoever said never judge a book by its cover was clearly talking about the fellas of the Diamond House. Behind the boyish looks and shy smiles of Nando, Hakeem, Bolt and Bimp are a couple of mischievous, thieving imps. Tonight the bad boys banded together for a common cause – to hide bottles of alcohol away from the rest of the Diamonds. After sailing to a smooth Task victory earlier in the evening all of the Housemates were elated as soon as the announcement came from Biggie that the storeroom had been opened. 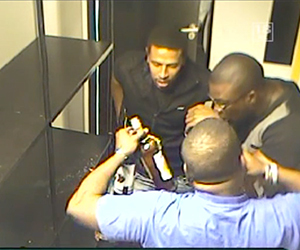 It was during this time that the lads took it upon themselves to stash some booze for themselves. “Stash it, stash it, stash it,” Nando urged as the dudes did their best to not get caught. Wow these guys are obviously very passionate about their booze. It just goes to show that when it comes to the handling of alcohol in the Big Brother House, trust nobody, absolutely nobody.